With the ribbon cutting for the paddle launch at Highland Road Park coming up next Sunday, we headed out in the rain to make sure everything was just right. Now, all we need is for everyone to spread the word so we have a great turnout on the 15th. We haven’t had much rain at all for over a month, and even with Hurricane Nate flying by to our east, barely anything fell here. Of course, the water level in bayous is affected by more than just rainfall. Bayou Fountain at the launch was a good 16 inches higher Saturday than it was a week ago (two stairs — each stair is 8 inches tall), and it was actually flowing upstream all the way to Siegen/Burbank and beyond. With very little (wrong way) current and only one viney tree to deal with, it was a pretty easy day. 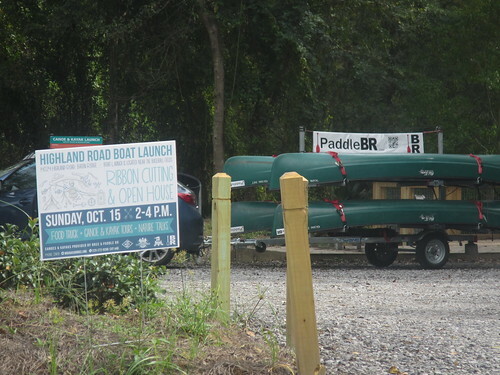 After paddling downstream against the current and back to the park with the current, it was time to go home and get back to getting things together for the ribbon cutting and our upcoming third-annual PaddleBR Paddle-In Movie (tickets and boat reservations available now). We haven’t seen nearly as much publicity out there for the ribbon cutting as it deserves. Tell your friends. Post on social media. Tell your cousin who works for the newspaper or something? If you’ve been out to Bayou Fountain and enjoyed the launch, come on out and make the ribbon cutting day a big deal. If you haven’t been out, here’s your chance! 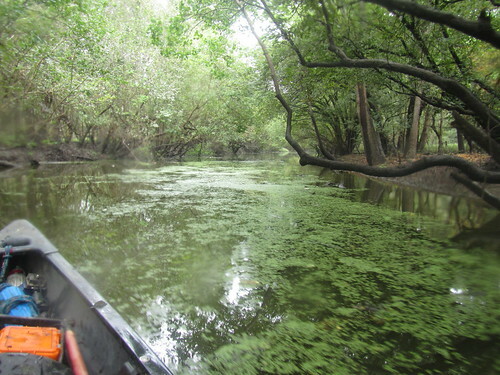 We’ll have canoes, BREC Outdoor Adventure will have kayaks, and we’ll be giving free mini-tours of the bayou. And speaking of giving things away, we always have fridge magnets, but we’ll also have pocket-size laminated paddle trail map cards. 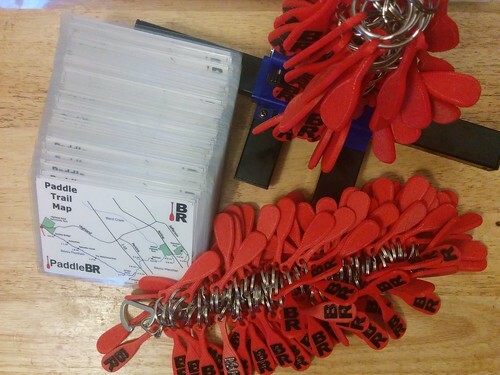 Of course, you can get either of those from us anytime, but the PaddleBR keychain paddles? Those are special editions only available on the water. 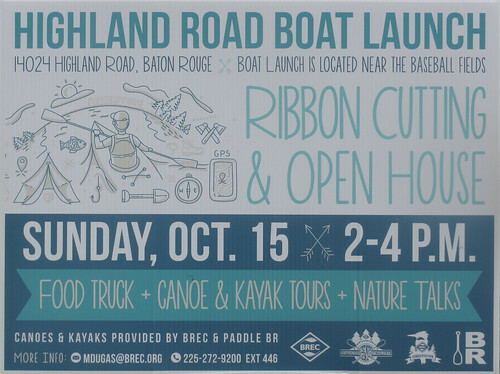 Come on by the ribbon cutting, paddle a sample of Bayou Fountain (or bring your boat and paddle it all), and claim yours. The ribbon cutting itself is 2-4pm on Sunday, October 15th, but we’ll be there early. Drop in any time after 10am for your free guided mini-tour and souvenir swag. We’d really love to see everyone out there.